It is funny that even though my blog is still one of those small ones, I still need to include you guys in my life for the sake of being polite. I shared my recipes, my hopes and my dreams with you in hope that I can relate to someone in this big wide world. Some of my stories are funny, series, rambling and other just screaming “first world problems”, however today I am letting you into my life a little bit more than I ever thought I would. I am not the most family oriented person but I love my family more ever day as I have matured in to an (hopeful respectable adult). They are not perfect but I am not either, so we are always having an adventure of some kind even if it just at the local store. Today my adventures with my family including my dad will no longer exist. Even with my dad’s thick skin it could not protect him from what has happened. Last week my father became terminally ill from an accident in his garden. With only weeks left, please understand my blog may be a bit slow over the next few weeks as me and my family come to grips with this tragic event that has so suddenly rained upon us. Be rest assured I am still baking but sometimes I will not have the spark that was in this blog a month or so ago. I may not just to update as much as I want or have the time but do not stop following me. I am still thinking of this blog even now. Thank you if you have taken the time to read this; I know it is the no the most exciting reading but if you could send your prays and wishes to my mum, sisters and his family; I would be more than welcome to deliver them. If you are looking for a bread that is simple but can elevate even the most mundane sandwich (ham and plastic cheese) to something even culinary critics would be hard to argue with; this is it. You know recently I made a pesto from my herbs in my vegetable garden; Today I taking those herbs and placing it a whole meal bread! Healthy, delicious, everyday staple that would go with your cold meats and grilled vegetable toasties. 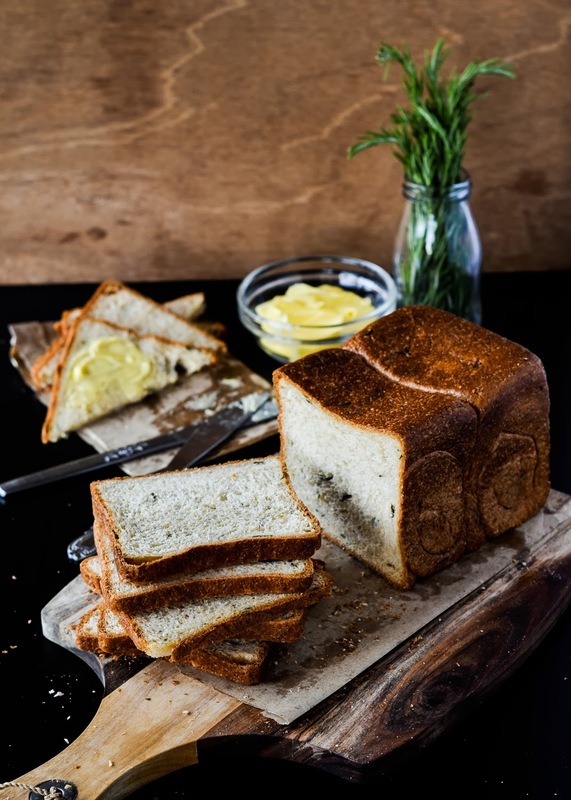 This bread is soft and mailable like store bread, with no butter, chemicals, milk or cream. 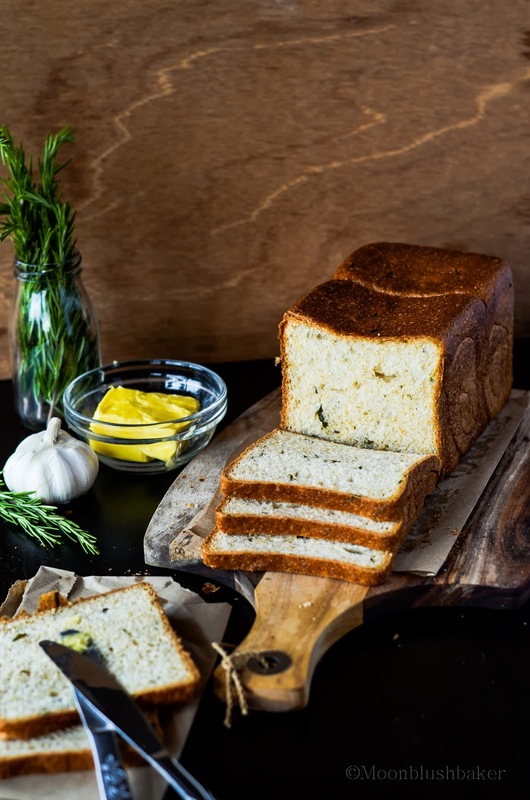 Instead of bland whole grains it has intense herb perfume that mashing up tarragon, basil and rosemary with a cloves of roasted garlic. 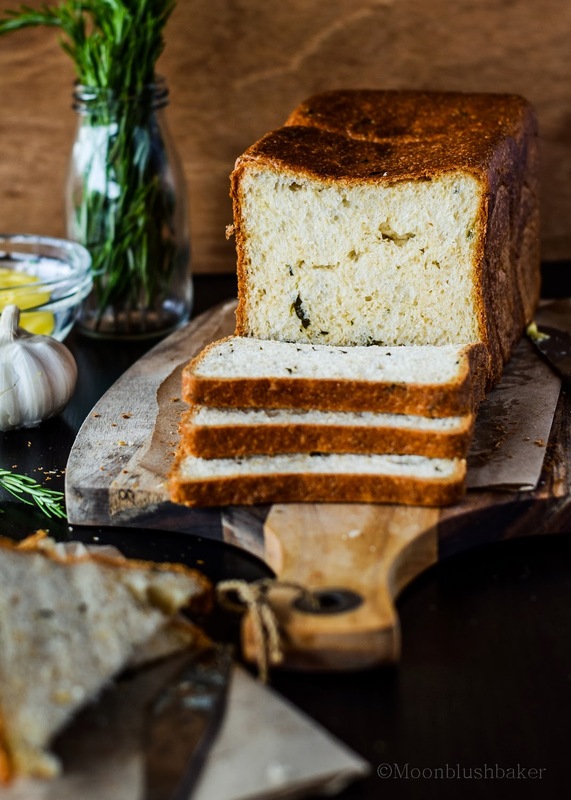 Yep it is garlic herb bread that you can eat every day; how can beat that? Don’t ask me; try it and get the results at home! In a small bowl, mix garlic, oil and herbs. Allow to sit for 2 hours to infuse. In a stand mixer or large bowl mix the flour, bran, yeast, tangzhong, water, egg, sugar, infused oil and salt. 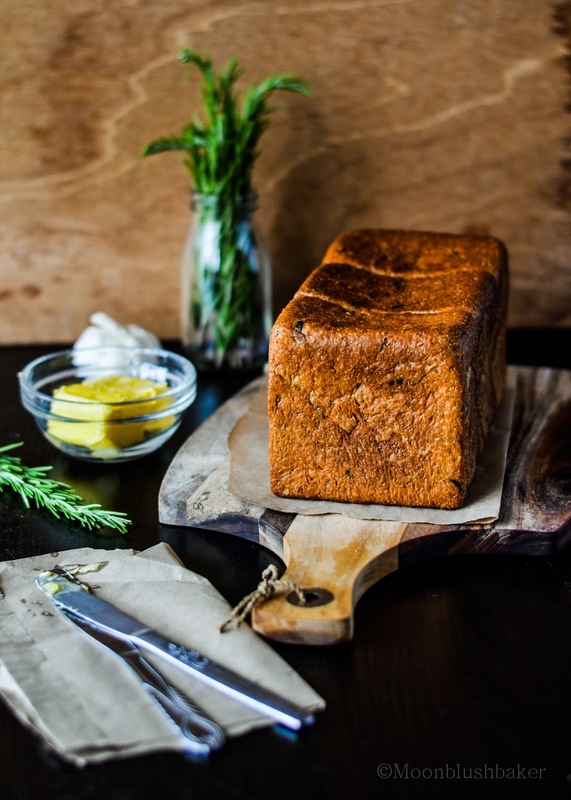 Once combined by using a wooden spoon or low on the stand mixer; knead until it forms dough. Once kneaded, knead on a floured surface until it become smooth and bouncy. It should be pulled enough to see though like a window pane. I did this by hand 40 minutes with a rest in-between for 5 minutes. In stand mixer it can take 12 minutes. Once ready place in clean oiled bowl and allow to rise until doubled for 2 hours. During this period, grease your pull pan and lid with butter. Punch down dough and divide into 3 equal pieces. Roll each piece out to a 20 by 10 cm rectangle, with the shorter side facing you fold in the long sides to half way then roll the rectangle up like jelly roll. Place in pan and repeat with remaining two. Place the lid on the pan and allow to rise until it almost touches the top about 80%. It can take a while, maybe 3 hours. 15 minutes before baking pre heat oven to 220C. Once it ready turn it down to 180C and place in the bread bake for 25 minutes covered and 10 minutes uncovered until it comes to 190F or high 90C on thermometer. Oh Belinda, I’m so sorry to hear about your father. You and your family are in my thoughts and prayers. Hang in there. 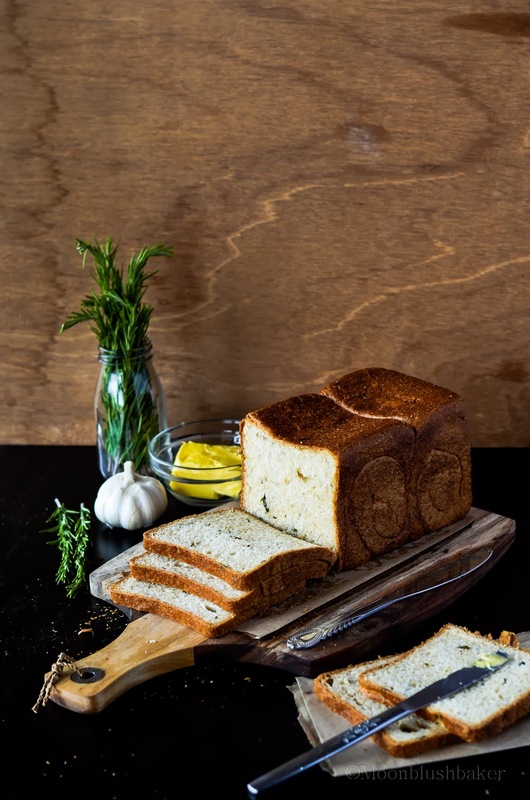 This bread is just gorgeous, as always with your creations. I feel like I can smell it through my computer screen. Very sorry to hear about your father.. Know that you and your family are in my thoughts and prayers. sorry to hear. my thoughts are with you. Thank you for the photography comments. I have not had much time lately , so this has made me very happy. I’m so, so sorry to hear about your father. I am praying for you and your family during this incredibly difficult time. 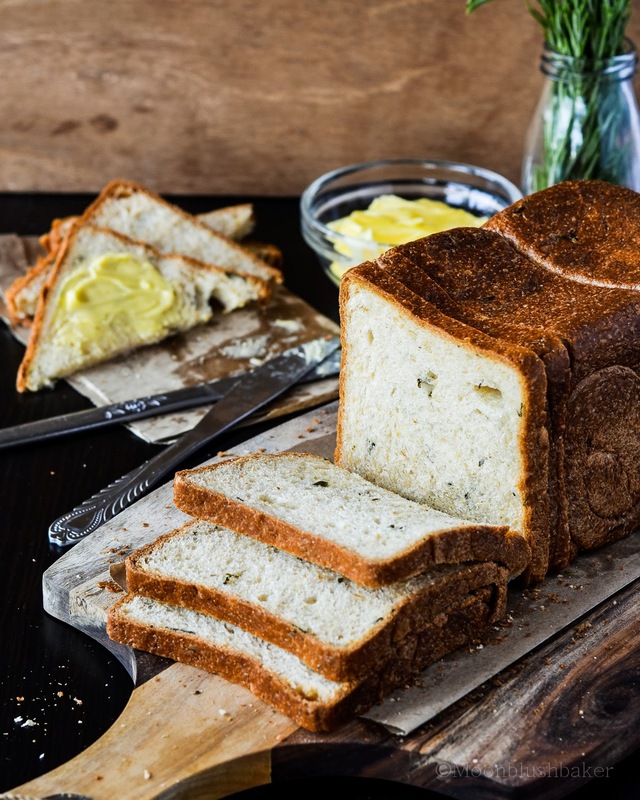 Your bread is just gorgeous, I love all the fresh herbs. Thank you Laura. This is all I have left to remember him by; I hope I can make his garden produce proud. Just happened on your blog from a link in Smitten Kitchen. How lovely! Best thoughts to you and your family. Aw thank you for liking this post. It makes me smile when I get a new fan, Marita. Trisha, your words and wishes are well received. Thank you. Love your wishes are well needed, Cheri. Thank you! I’m so sorry to hear that, Belinda – will keep your family in my prayers. So, so sorry to hear about your dad. Good thoughts and prayer sent out to you and your family. omg.. I’m so so sorry… How could this be? accident in the garden!? I hope there wasn’t too much suffering, and you take care of yourself during this difficult time. This is such heartbreaking news. I am a new reader to your blog (and it is so lovely), but my heart goes out to you and your family. Thank you Cindy. My family could use all the support they can get.